December is a nice month in Australia. It’s not too hot and not too cold, which makes it perfect for travel photography and capturing the bush on film. December and the bush; for me, they just go together. Growing up un Australia meant that Christmas was all about Santa in his board shorts. This special part of the Southern Hemisphere doesn’t see snow in December, but rather, often 40°C, which can mean bush fires. It’s part and parcel of celebrating yule-tide in a warm climate. Hot days, sweaty nights, beach cricket and a whole host of cold cut foods for Christmas lunch with the family, usually while watching the updates on the bush fires on the news. 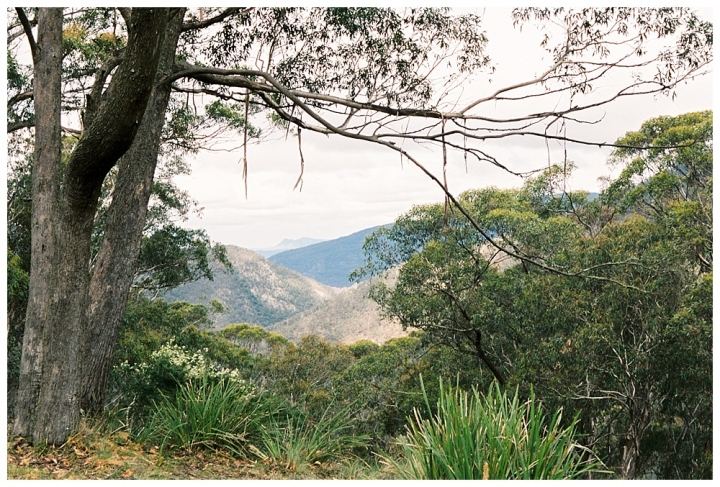 The Australian bush has that kind of harsh beauty that some have come to find synonymous with Australia itself. Tough, rugged and yet with a serenity that you’ll only discover if you put on your hiking shoes and make tracks into the midst of it. The cicadas and birds all sounding out their own song can at first sound like just a mess of noise. But if you stop and listen to it all, there’s a certain bush symphony that you come to admire. Occasionally, you’ll see a Christmas Beetle flit by your head and then you know it really is Christmas-time. Bush walking in Australia is a big part of summer life and a big part of celebrating Christmas. It’s not uncommon for the family to all pack into a car on or around December 1 and “head bush”. My family did this and I admittedly hated it. By the time I was a moody teenager all I wanted to do was hang out in my bedroom with my music and my art and the last thing I wanted to do was have to traipse through the bush singing Christmas songs and looking for that one holy, perfect Christmas Tree. I’d moan and groan and drag my meet and hope I didn’t walk into a spider web. We’d walk so far in sometimes that I wondered if we’d ever find our way out. I just couldn’t understand why we couldn’t BUY a tree. Now that I’m older, I don’t mind being in the bush. I’m still not a fan of all the spider webs, but I adore the sounds of the animals and the smell of the Eucalypts. 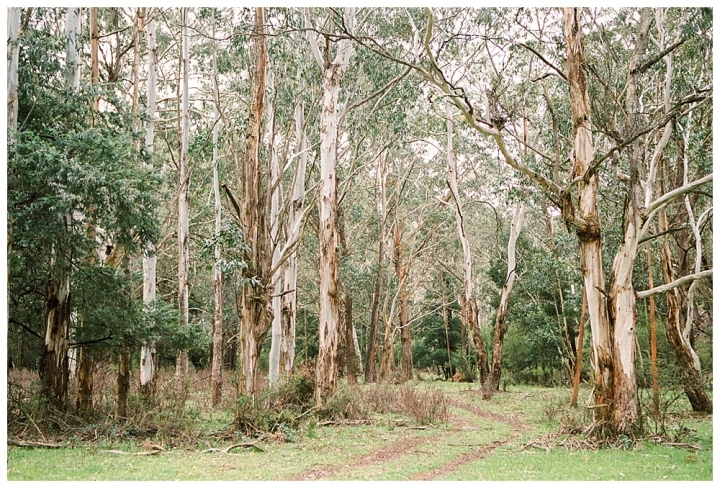 Even now, during my travels, I can spot a Eucalyptus a mile away, usually by their smell. To me, it’s a very Australian smell. When I was in San Fransisco I spotted them before the guide book could confirm it. It’s in my blood. I sometimes feel like Eucalyptus is running in my veins. It’s because of this that I love to photograph them. While I didn’t appreciate those bush walks when I was a teenager, it definitely set me up for enjoying nature now. These days, I seek out places that others may simply overlook as they pass by. The light in Australia has a quality that you won’t find anywhere else on earth. You might come close; California came very close, but it’s definitely not identical. Monet would have love Australia; the ever changing light, the beautiful landscape. He would have sat in the same place, painting the same scene over and over and capturing the different stages of the day. I feel the same when I shoot film in Australia. I find that film captures this quality of light in a completely different way than digital does. While beautiful, the light in Australia can also be very harsh, with long, strong shadows and a strength that burns your eyes. I often get headaches when I am back in Australia because the light can be so strong. In the end though, it’s all part of the experience. If you make it to Australia, make sure you also do a trip to the bush. It’s never too far away and it’s one of the best authentic experiences Australia has to offer. You’ll be amazed at the amount of wildlife you’ll come across and pleasantly surprised at how beautiful the bush is. There is an official website that you can visit called Bushwalking Australia, which organises bushwalking tours and publishes it’s own magazine. There is even a forum where travellers can connect with each other about walking in the bush. Just remember to take plenty of water with you as the Australian sun is quite the thirst maker. If you would like to know more about making travel photography or fine art prints with me, feel free to contact me on my email hello(at)cjeklund.com or through the CONTACT section of this website. Country America is an extremely beautiful place. 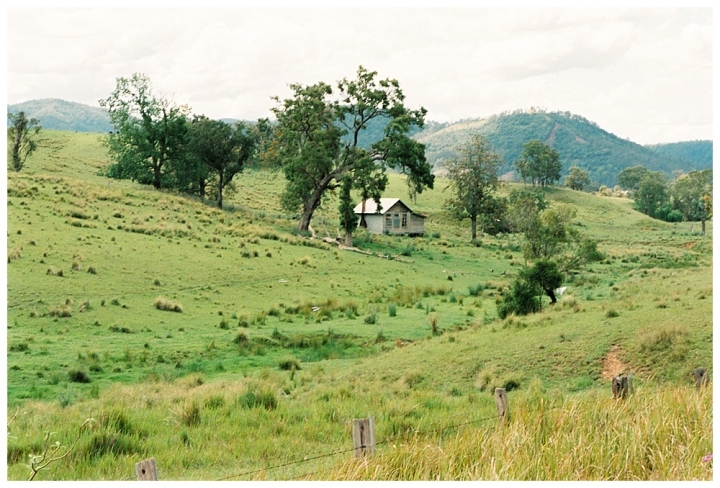 It has a kind of rural beauty that seems to rise from the rolling hills like a storybook fairytale. I travelled to this countryside to photograph some portrait photos in New Jersey for a gorgeous American family. Photographing portrait photos in New Jersey isn’t something I thought I would be doing when I first started travelling and making art. Even so, I get to fly to far off lands and meet fascinating new people. Two of those people I had the honour of meeting and working with are T and CD and One of those places is New Jersey. Who would have thought? Sadly, the only thing I really knew about New Jersey is what popular culture had told me. Things like people from the Garden State saying they’re from New York, which New Yorkers apparently don’t like, and, embarrassingly, Jersey Shore. Not a very flattering picture. However, I can honestly say that New Jersey is one of the most beautiful places I have had the pleasure of visiting. It’s green. It’s picturesque. It’s friendly. It’s like something out of a family friendly television show or a Norman Rockwell painting. It’s here, in New Jersey, that I got to know more about T and CD. Meeting this power couple is something of a wonderful experience. T owns one of the most prestigious Fly Fishing businesses in the United States, called The Perfect Cast, and CD is a working Artist specialising in on-location sporting artworks in oil and watercolours. It’s precisely their professions that make T and CD the perfect couple. I was honoured to be able to make some portrait photos in New Jersey with T and CD at their private residence. A gorgeous house, set back in the Jersey forest, down a gorgeous country tree-lined lane and backing on to a nature reserve. Perfect for two people whose life centres around nature. T and CD have two game dogs and had just gotten a new puppy to add to their family. He was quite the curious George and was extremely interested in CDs studio and his paints. The love and affection that shines through in T and CDs portraits is immediately evident. Not just the love for each other, but the love for their dogs. They’re not just family members, they are also business partners so it made perfect sense that they would be included. Because of CDs artistic tendencies, he even designed Ts necklace and had it made from the spine of a Salmon that T had actually angled herself on one of their many fly fishing expeditions. The two regularly take trips to places like Iceland and have many intriguing stories of their exploits to tell. A lot of their expeditions can be seen in CDs paintings, too, which are widely sought after around the world. I used Fuji 400H pro 35mm film and a Canon EOS 1v to make T and CDs portrait photos, but I would love to see CD paint one of these portraits and give it his uniquely beautiful style. I think that would be a very interesting concept. I love seeing the same subject in different mediums. I have learned that just a week ago, T and CD lost Chess, the dog posing so regally in the long grass below. Chess was so suddenly taken from them by way of a Rattlesnake bite while on a Quail Hunting Expedition in Georgia. Chess was an extremely friendly, intelligent and intuitive sporting dog and family member and he is sorely missed. RIP Chess. I know you’re up there in Doggy Heaven with as many treats as you can imagine. If you would like to know more about having your portrait photos made with me, feel free to contact me on my email hello(at)cjeklund.com or through the CONTACT section of this website.